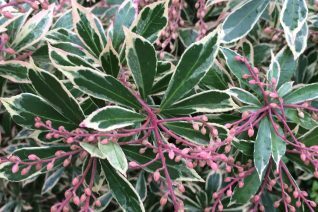 One of the best variegated Pieris on the market. This plant was brought to the U.S. by Gossler Farms in Springfield, Oregon and has gained great popularity. In our experience the ‘little’ refers not to the overall size of the plant- which is eventually large 5′ x 5′- but to the smaller size of the leaves. And each leaf is outlined in white with a darker green center. In full sun this shrub sets tons of chains of pink buds which open to white flowers in Feb/March. The overall fine texture combined with the white variegation gives this plant a very graceful mein. New growth emerges salmon and ages to light yellow before its final destination of green and white. Occasionally shows all green reversions. Simply cut these away. Full sun to quite a bit of shade in rich to average well drained soil. Grows more quickly with regular summer irrigation but established plants sail through summer with a minimum. Very hardy to cold- and tolerates subfreezing wind well.